The disaster known as regulation of the Victorian building industry keeps creating and spitting out victims and has gone on now for well over a decade. We have all been impacted in one way or another by the cutting of red tape. Many other commentators have spoken at length on the same topic. So we all know the shortfalls and all the survivors are on the same page. Like any major disaster, we must look at root cause and look back at how it went so wrong. Many of the shortfalls started when we rewrote legislation in 1993, which created change in terms of regulation. This was compounded in 1997 when we embraced self-certification, dumped the HGFLtd and embraced privatisation of the consumer protection. In 2001, HIH collapsed and in July 2002, we railroaded in the Last Resort Warranty Insurance (BWI) for domestic builders and excused all commercial projects from any of the regulatory constraints suffered by the domestic builders. No doubt there are hundreds of other well-documented contributing factors, along with governments who refuse to invest any funding whilst maintaining their cost neutral regulators. The majority of people involved had little hands on experience in our industry and at best were peripheral to our mainstream industry. Add to the mix our legal fraternity and our insurance underwriters just to make sure we had a perfect storm. Hence the tail started wagging the dog. We currently see the VBA coming out of their third year and struggling to manage their authority in an industry worth more than $20 billion. Their budget of around $50 million is self-funded by the building industry, with roughly $18 million from the plumbing industry and $32 million from builders. Some 75 per cent of the VBA is spent on building, and 60 per cent of that is on governance of commercial projects. So clearly others are paying for the management of a non-paying sector. An easy example is the VBA certificate of compliance for a hot water unit installation, which is worth $33.87. The cost for the certificate of compliance for a newly built school is $33.87. So clearly we see major issues in how our industry can be properly regulated by anyone with such significant financial constraints completely skewed by poorly written legislation. As we see the introduction of amendments of the Victorian Building Act focusing mainly on consumer protection, it appears nothing is going to change. Once again, peripheral players from the insurance industry seem to have most of the say in our building industry. A look at home warranty insurance cover offers an insight as what is required to access the current insurance model. It is not an easy process and requires specialized legal counsel. Still, it’s hardly insurance at all, and is only accessible for the wealthy or naive. We once again see the current mooted amendments relying upon the VCAT process, which has been widely accepted as flawed from start to finish. An example of how the insurance underwriters have contributed can easily be illustrated with the recent changes in how basic fascia gutter is installed. A recent directive from VBA says all that is required is a minimum 10-millimetre gap between the fascia and the back of the eaves gutter. So how did this come about as we have been installing gutters directly on facia from the late 1800s? Did industry play a role? Why was everyone surprised when this directive came out? Did they consider other overflow measure shortfalls, storm water pipe design and sizing, council discharge points or rewriting formulae for load calculations? It sure doesn’t seem like it. The insurance industry drove the issue due to excessive claims, which is a clear snapshot of how we have ended up here. There will be many who will complicate and put a variety of reasons why we can’t make quick changes. As we previously stated, the J curve of non-compliance and regulatory failures is currently impacting our industry with devastating effect. Everyone wants proper regulatory governance, which maintains a level playing field for all. Currently, the diligent, highly skilled practitioner is suffering in work allocation due to the ravages of poor regulatory compliance allowing our industry to continue its decline with building failures and disputes occurring in over 90 per cent of works. Uber provided a solution for the festering taxi industry issues and consumers have embraced and enjoyed the change it brought. We too can achieve this change! But how? For starters, our industry cannot be regulated with its current budget of $50 million. At best this is tokenism. Government’s propensity for increasing this to $200 million will be determined by the ability to remain cost neutral. How do we achieve it? A) A user pays system for certification. The above example of the cost of a certificate of compliance $33.87 regardless of the work involved demonstrates this. A sliding scale of certification costs can be introduced as a statutory charge for large projects and commercial licensing. Example: a new hospital would incur a charge based on budget and duration of the build – let say $200,000. In this cost, it would allow for one day a week for an on-site inspector (clerk of works) for the duration of the build that would monitor all works as the construction took place. This would then not only limit post construction defects and costly legal claims but also monitor permits and statutory requirements covered by the BCA and PCA. Due to many of the VBA’s current inspectors being very green, it would also improve the inspectorate’s skills set on a user pay basis. B) Currently we have each council running building departments, which interpret the BCA, and the relevant local council-planning permit. This is duplication and is one of the many problems and seen as problematic with many misadventures. The recent Mt Waverley excavation site is a clear example with much finger pointing and no doubt a long legal journey to unravel. Clearly, planning departments have local council uniqueness, but the building department could clearly be centralized via the VBA. This would add cost saving to councils and introduce further revenue at the VBA. C) Building surveyors’ conduct has been well documented due to commercial relationships with their builder. This has clearly been proven to compromise their roles and lead to many complaints, deserved or otherwise. A simple solution is to set up the cab rank, centralized via the VBA register with building surveyor classification and locality determining who is dispatched to what job. This will maintain impartiality and centralized governance. It will also provide a further revenue stream whilst quickly overcoming many of the issues. D) Those who have long histories and experience in the building industry are often precluded from any real input. As we all witnessed, trade groups have continually been compromised by focusing on securing revenue streams. They have fallen asleep at the wheel regarding regulation, much to detriment of the their membership. To this day, most of the relevant chairs on the various boards are filled with people rarely engaged or informed properly on our industry. The VBA itself has very little technical prowess in building knowledge until you get to their third tier of their corporate directory. Our industry needs to take back the many chairs and stop the cronyism each minister has facilitated in appointing these people. The PAC and BAC boards sit outside the VBA and purely report to the Minister. It appears this is a mandated part of the Victorian Building Act. We have continually tried to find the Plumbing Advisory Council’s agenda or minutes, but it appears to meet rarely, with its agendas largely unseen. Until the Minister takes this aspect seriously, nothing will change. E) Training pools were once a fall-back for the disengaged apprentices who were struggling to complete their four years, not a commodity and revenue stream for cherry pickers. Bring back proper incentives for the employers. We will then get proper vested interest in outcomes and skill sets. F) Many experienced highly skilled practitioners have asked for diploma level attainment. Rather than the mooted CPD with button boot course, which are purely revenue streams, redevelop proper training options for those who want to further their industry skill sets. Sanitary engineering, fluid mechanics, advanced CAD drawing, advanced estimation and quantity surveying and the like should be areas of focus. G) Licensing and registration is currently unclear and needs proper criteria and engagement with the RTOs. Many facets of the industry are still unregulated, such as the geo techs, hydraulic engineers, building consultants and so on. Although the above may seem simplistic it clearly can be achieved. The current three-year cycle for minor change will never regain proper governance and the decline will continue to occur if we don’t step up to the plate. Great article regarding the VBA lack of support for the industry and the slow death of our plumbing industry driven by insurance companies with there endless money to lobby the VBA. Monique, I agree that we should focus on a solution. How many thousands upon thousands of consumers have actively tried, and some have made it their life's work for decades. We have identified the problems – over and again these 'findings' on the public record and recorded in many thousands of owners' stories (most not in the public domain). It should be easy to apply rational problem solving skills and implement the solutions. But the key power brokers and their bureaucratic partners who devised this system direct policy and practice and they do not want to change the status quo which has delivered enormous financial rewards for them. In control, the system skewed to their advantage, the beneficiaries of Billions of dollars annually are the winners – this money lost from around 250,000 owner losers each year in Vic – and across Australia probably close to 750,000. What you may or may not know is that consumers have been totally locked out – voiceless and powerless – hence relegated into non-existence. This fact explains how consumers came to be totally unprotected. All letters, submissions, applications for Board positions, etc. are ignored – put 'in the bin'. Thus, why there is an unfair playing field, no 'fair go', no forum to be heard – and no possibility of any genuine reform. Government has the responsibility to create a fair market place, to allow consumers a fair bargain and to protect the innocent and punish those who are repeatedly recalcitrant. Until there is a commitment to these basic principles, there will be no 'solution'. The first step in that direction must be consumer consultation. Sadly a pipe dream! Steve, good response. There are so many more cases but everyone is getting tired of reading such. How can a regulator not regulate. How can a Minister be so naive and blind. Minister Wynne, you didnt create the VBA but you could be a hero reforming the system as a whole if you took advice from others who know what is going on instead of the current interested parties. The Government could set-up a totally self funded system where everyone wins. Accountability is the key. Interesting article. I would ask a simple question in respect of regulation. Why do we continue to have – for want of a better term – 'shonky' licensed builders and hence very poor construction outcomes? Many of the suggestions are entirely valid concerning involvement of building surveyors, clerk of works roles and insurance schemes to 'protect' consumers from poor outcomes in respect of delivery of any building construction project. But these measures are largely retrospective in approach. If Australia wants better buildings you better start implementing high quality standards of education and professional training that will see only those with such qualifications provided with accredited as 'Builders'. At the moment, the education and training system has moved in precisely the opposite direction with flunky 'training colleges' churning out building qualifications to anyone who pays the the fees and claim to know which end of a hammer to use. They do this via the Recognition of Prior Learning (RPL) scam. Governments and their requisite agencies at the federal and state level have done nothing to reign in the stupidity of a deregulated national training provider scheme that has been rorted for billions of taxpayer dollars and will produce tens of thousands of 'graduates' who are entirely unskilled but have a qualification that then enables them to obtain an occupational licence. Good luck future consumers. Your 'licensed' builder will be lucky to have a depth of construction knowledge equal to that of a contestant on the 'Block'. Ann, you make some good points but we want start now, not tomorrow, reforming the Industry. We all agree that it should be a level playing field and reforming with user pay will do this. The Government has to step in and have input, qualifications and legislation for all trades to be regulated. Why is it that only Plumbers and electricians and to a lesser point Builders are regulated. What about Surveyors, Engineers and god forbid Architects. When a Plumber makes a mistake he is an idiot and his Insurance is activated, sometimes without the Plumber even knowing. What about a Surveyor who passes a dodgey build. Where is the Surveyors Insurance and level of accountability. Same for an Architect. The VBA hierarchy is so dysfunctional and lacking in COMPETENCE, over paid and much more. The VBA is promoting an "us against them" environment. They dont care about the Consumer, they care only for their wages and job security. How many members of the VBA board have any building experience, none. What about the Industry bodies they consult with, sounds good doesnt it. Phils article if taken on its merit is about restoring confidence, honesty and integrity back into the Industry as a whole. Forget about the "Casino scenario" where the Consumers are against the odds of winning where the house, the top end of town Insurance Compaines, Developers and Lawyers prosper. Council Building Departments are just rubber stampers, they dont take responsibility for anything, especially when things go South. Again look at the Highbury Rd/Huntingdale Rd site. So VBA, how are you protecting the Consumers. Very well written Phil. Beatrice you really must get out and see the destruction caused by you and your fellow de-regulators. Australia and Victoria in particular are hamstrung by so many public servants who do nothing. Typical White Collar protectionism of their own existence in the guise of Consumer Protection. If you are happy with a knock-down and re-build every 10years scenario then continue on the same trajectory we are currently working under. ALL of the Boards are stacked with Lawyers and Financial "wizards" who are blinkered. More regulation will do three very important things. 1)It will deliver true Consumer Protection without exception. It will allow the Regulators (and also keep the Regulators honest and educated) to ensure that the works carried out and paid for by the Consumer are right. 2) It will reduce the Insurance and subsequently the Legal smorgasbord that currently exists. The likes of HIA and Co. will no longer be able to prosper from false and misleading Insurance policies. It will also aid in reducing the ease of escape that currently exists with shonky builders to just go broke and leave THE CONSUMER in tears. 3) It will promote better education and investment through our trade schools. It will take away the quasi feel good teaching and replace it with quality as we originally had and enjoyed. Beatrice you are just looking after your own interest and not those of the CONSUMERS that you, and the Government Minister Wynne and the current VBA continually profess to be doing so. Stop the rorting of the Developers. Make them accountable just as we all are. Make them responsible for Regulating the Industry, not sitting there taking wages deceptively. Regulation is PROTECTION for CONSUMERS. Steve, you make some excellent points re the faulty legislation, the role of the HIA, the legally unfair contracts, etc. I would agree on adding some extra inspections, but this impossible – there are few competent, decent 'inspectors' – and even fewer who are ethical. They can't manage to inspect and certify compliant work now! This is a critical factor in explaining why so many rotten buildings are 'certified' as compliant, passed to trigger owner payments – and as they say the rest is history! A mega disaster, the likes of which we have never seen in our history. And the reality made to 'disappear' from the public sphere. Compliments of our Ministers, their Shadows and the senior bureaucrats! Re your point on the 'Mr 32 Man', you are spot on. So how many more 'Mr 30+ men' are out there?' The answer is unknown, but the anecdotal evidence is very strong. I personally know of hundreds of builders and surveyors who are serial offenders. As you say, many cases go to VCAT and there they play OUT, legally 'disappeared' and hence never happened'. So many do a phoenix and rise the next day for several companies already in place – and the insolvents remain 'registered'. Even if suspended, or as rarely is the case deregistered, they continue the merry-making and continue to 'build' to destroy more families – all of this Govt approved.The vast majority of VCAT cases remain hidden – and hence no information on same is accessible! As for VCAT's responsibility to advise the BPB or VBA as a consumer protection measure – it has never done so! All part of keeping consumers in the dark – it's control, or enforcement of consumer ignorance which is the key to delivering this consumer disaster. Phil, I agree. We have a 'regulatory disaster'- the impact of zero regulation has enabled the industry to be lawless and combined with zero consumer protection, we have a massive CONSUMER DISASTER – also reflected in our appalling built environment! The ruined lives, the pain and suffering foremost hurting millions of Victorian families. As you say the root causes are known – contrivance to protect big business – with consumer outcomes known. The 'no touch regulation' of all in the building industry was/is the policy -instead 'consumers' are the ones regulated and con-trolled! You are right on the 'perfect storm' and the role of the legal fraternity responsible for a system designed to reward those in the business of building and the legal eagles who have made a fortune out of the once small offshoot 'dispute business' – now a fully fledged industry increasing exponentially every year. Then add the Government gifted insurance premiums to the mix – for the insurance industry, this beyond any definition of a scam – simply scandalous! The VBA is the Building Commission – re-named with 'shifted chairs on the Titanic'. But it seems from reading the recruitment pages that every week the VBA purchases more chairs! The VBA is not 'struggling', rather it is not trying. The same culture continues, the same unhealthy buddy network remains, the 'corporate governance' structure lingers without any consumer reps and without any Accountability. And according to the last Annual Report, of the money to 'self-fund' it is not industry funding the VBA,CONSUMERS who paid $24.5 Million, or half via Building Permit fees! The solution is simple – and no NOT "everyone wants" it. Decent souls in the industry and consumers offer the only hope! Great article Phil. It has been over a decade since I have read anything which will make a positive change. Clearly Beatrice is has been under rock somewhere. All of us working in the building industry know we have been hijacked for the last 20 years by at best peripheral players and external players with little knowledge let alone experience as to what is happening at ground level in the building industry. Tokenism & poorly managed regulators have allowed all of us to be rorted & livelihood's put at risk. The white collar worker could never trust a tradie to know what is good for us. Current chair of the VBA is testament for that! Give me a break how anyone could not see any conflict of interest with that appointment!!!! This is the second time I have read Mr Dwyer calling for more red tape! That's more and more regulation which Mr Dwyer states clearly he is in favour of. As for his list of simplistic 'quick fixes' give us a break! A very well informed article, thanks Phil. You mention the problems eminate from the 1993 Building Act and I agree. So why not reverse it? Put inspections back under council control and easily funded through diversion of a proportion of the levy already charged. Currently the surveyor uses this as working capital and the VBA, if it collects it, as a 'party' fund. The VBA is not the concerned with standards or consumers, they're there to keep the truth under wraps: for example Mr Keffords decision to hide the builders disciplinary records and reversed by Vic Ombudsman but only upon prompting. Ms Digby's actions follow the same traits. You do not mention The HIA – the builders friend. The standard HIA contract has payment front-loaded, so reverse it. With payment made in five stages: 5% deposit then 10, 15, 20 and 50 percent payments dependent upon sign-off of four inspections. If a builder cannot manage his finances then he shouldn't be in business. Builders Warranty insurance is a waste of paper and just another income stream for The Govt. There are two builders lists referred to by Con Giazzi, one The Govt uses and one the rest of us are forced to use. The insidious 'gagging order' so common at VCAT that prevents consumers making informed decisions. I know of one builder who has appeared at VCAT 32 times, settling all but one, the gagging order used on all but one, offsetting legal costs against tax. An almost blemish-free record that hides the truth. Finally, it will take a 70s style disaster and global scrutiny to shift any government and that day almost happened with the Lacrosse fire in 2013. 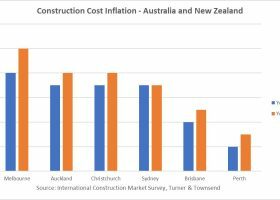 Are builders profits more important than people? They are in Victoria!